Diamond and Rib Funeral Vase. 18 inches tall - Amethyst. Interior iridization on Green WATERLILY & CATTAIL Bowl. Green WATERLILY & CATTAIL 10 in. Bowl. WATERLILY & CATTAILS green bowl: These 10 - 10½” bowls in green do not present themselves very often. The few we have seen over the years are always iridized only on the interior. The waterset, tableset and small berry were produced in Chocolate Glass. Jacob Rosenthal, a chemist for Indiana Tumbler and Goblet Co. at Greentown, IN shared the formula with members of the Fenton family. Fenton produced a marigold water set, circa 1908 resulting in 3 different tumblers (differences being in the design of the cattails.) 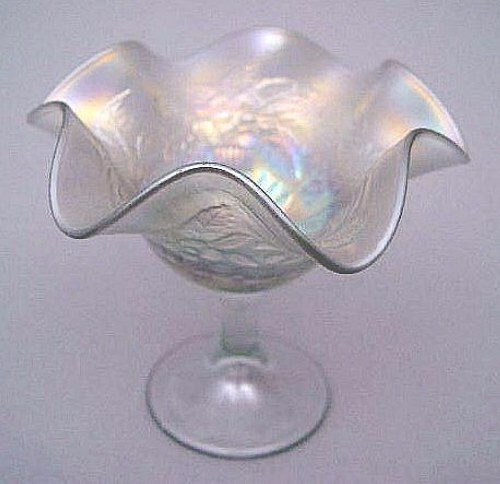 Fenton also produced a blue opalescent tumbler, amethyst opalescent crimped bowl, along with a covered sugar in that color. 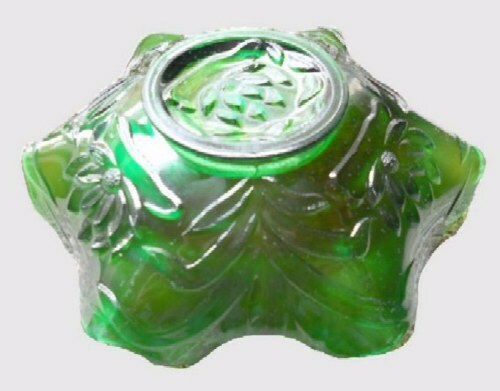 A green opalescent tumbler is known in this pattern, as well. Waterlily and Cattails 8 pc. berry set. WATERLILY & CATTAILS berry set: This being the earliest of Fenton patterns to be iridized, it is most unusual to find a complete berry set after more than 100 years! Water sets and table sets are found in marigold as well. Ruffled Hat from a tumbler. 4 in. WATERLILY and CATTAILS Spittoon. Sold for $2000 in August 2011 at Wroda Auction. WATERLILY & CATTAILS whimseys: Somewhere in the span of 100 years, someone re-heated and re-shaped these two original tumblers. It’s always been curious that these distortions of the original, not only destroy the pattern, but bring such large sums of money at an auction! Do buyers actually “believe” that items such as these left the factory as such???!!! Having seen first-hand, the reaction of a buyer to ANY variation in an original order, the answer is: the entire shipment would have been RETURNED! Collectors are somewhat gullible and strangely accepting of these “stretches of imagination”. To each his own!? PEACOCK and URN - 9 inch in Marigold. over Moonstone. PEACOCK and Urn Compote - White. PEACOCK and URN Compote in Vaseline. PEACOCK and URN Compote in Lime Green. PEACOCK and URN: The bird in Fenton’s Peacock design has a long, straight stiff neck. Bowls and 8”- 9” plates offer a sawtooth edge. 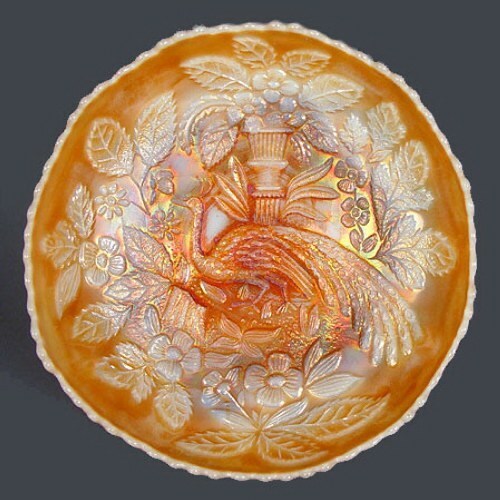 The Marigold over Moonstone ice cream shaped bowl is quite unusual (rare), but then the Persian Blue examples are too. The few known red bowls have brought more than $5,000. Additional colors are amethyst, aqua, blue, green, marigold, olive green, purple, vaseline and white. 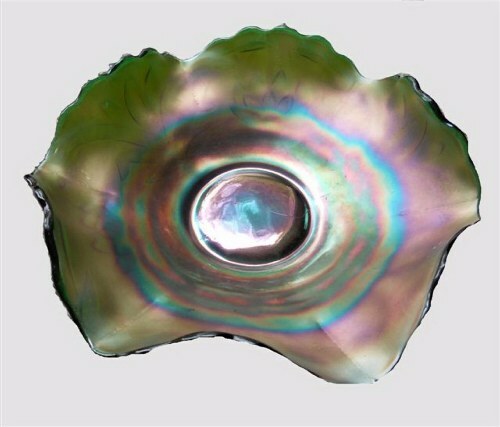 Bowls having 3/1 edge are more scarce and found in amethyst, green and marigold. 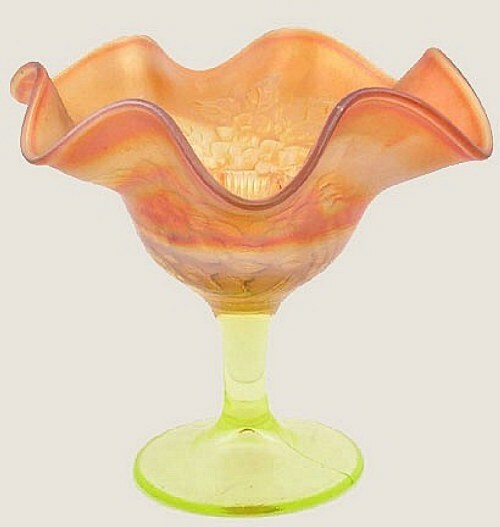 Goblet shaped examples are known as “mold shape”, not having been flared or ruffled when removed from the mold. 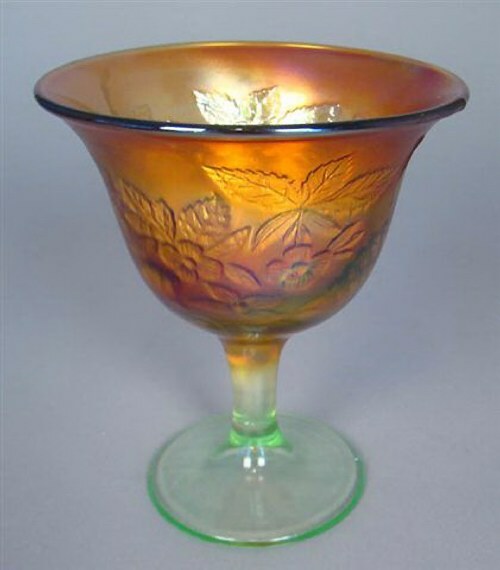 Compote shapes (flared, ruffled, or goblet shaped) are found in amethyst, aqua, blue, light blue, green, lime green, marigold, red, vaseline and white. 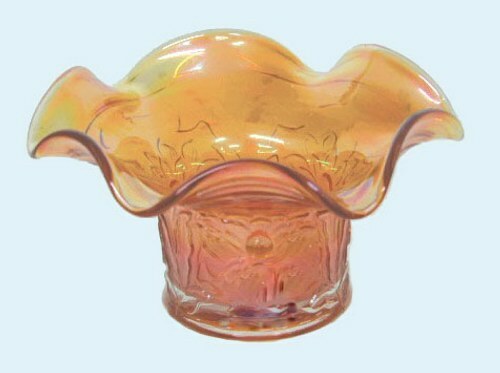 Fenton FLUTE Vase - 9.5 in. tall.- Marigold. 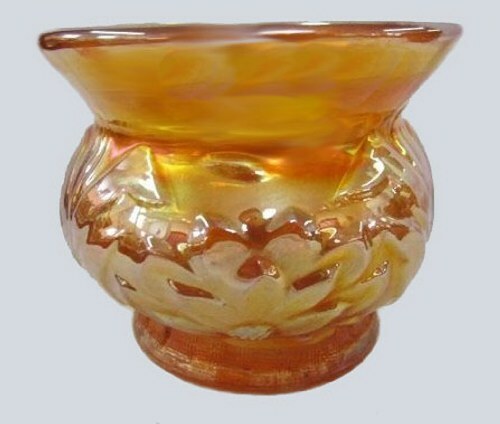 FENTON FLUTE Vase: Has a 2 ½” base and six flutes. Scarce in marigold, red, amethyst, vaseline, green, celeste blue (rare), blue, aqua. Fenton APRIL SHOWERS - Marigold - 11.5 in. tall. APRIL SHOWERS Vase: Have a 3 ½” base. Amethyst, amethyst opal, blue, green, ice blue, lime green, marigold, red, teal, vaseline and white.